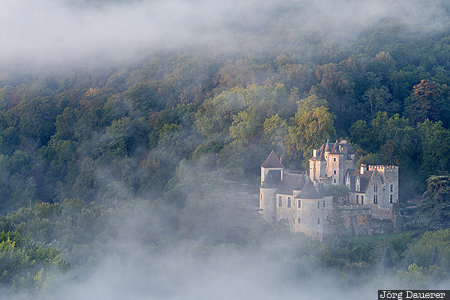 The castle Château des Milandes above the Dordogne river surrounded by morning mist seen from Beynac-et-Cazenac. Beynac-et-Cazenac is in the region Aquitaine in central France. This photo was taken in the morning of a sunny day in September of 2015. This photo was the image of the month in March of 2019. This photo was taken with a digital camera.